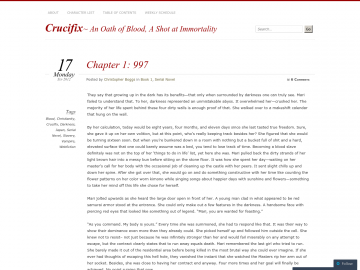 "An Oath of Blood, A Shot at Immortality"
"Who knew the road to becoming a vampire would be so long and so perilous." A bi-weekly serial detailing the life of a blood-slave named Mari. Mari's goal is to become a vampire, but the only way to achieve it is to fulfill a contract that requires her to be bitten by 1,000 vampires. With angry vampires and bloody addiction, will she ever achieve her goal and become the immortal vampire? Crucifix has not been tagged yet. Help others find Crucifix by tagging it! Crucifix has not been reviewed yet. Crucifix has not been recommended yet.